Invocon has recently finished a Phase II Small Business Innovation Research (SBIR) contract with the US Navy to develop the Un-tethered Velocity of Sounds Profiling Sensor (UVOSPS) system. The purpose of UVOSPS is to measure water column sound velocity in littoral regions. The sensor system includes multiple miniature probes that are periodically released to descend through the water column and send both temperature and depth information back to the host-buoy. Sound velocity is then calculated from these parameters for use by Navy Anti-Submarine Warfare (ASW) personnel. It is not so much the changing velocity that is the problem as it is the refractive effects of acoustic energy passing through water with varying velocities. This causes the sonic energy to travel in arcs and curves, requiring complex computer calculations to determine the actual directionality to the source based on the SVP. If the temperature and salinity of water were constant, the SVP of water would have a steady positive gradient. As sound passes deeper into increasingly higher speed waters, the energy will begin to deflect back towards the surface. However, the temperature of the upper portion of the ocean is in constant flux because of daily sun cycles and weather conditions. This leads to three common distinctions in ocean layers: surface, main thermocline, and deep isothermal layers. Proper understanding of the current SVP will allow sonar technicians to transmit and receive in the proper direction and enable the channeling of the energy along a surface duct or sound channel. Finally, it can also reveal a blind spot in the shadow zone where submarines can hide; this occurs at the inflection point between the positive and negative gradients. 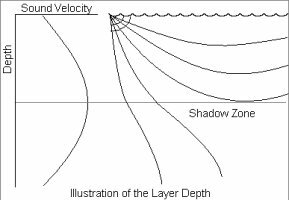 This layer depth phenomenon is illustrated in the above figure. For many tactical operations, SVPs must be measured over a large geographical area as well as over a longer time period than has been required in the past. While wired solutions have helped to solve this problem, they add additional problems due to tangling of the thermistor strings. Invocon’s wireless SVP system provides an enhanced capability by enabling a single buoy to gather multiple SVPs. This is possible by using wireless sensor probes that gather SVP information as they descent through the water column and transmit the data back to the buoy using a wireless data link. The image below shows the system concept. 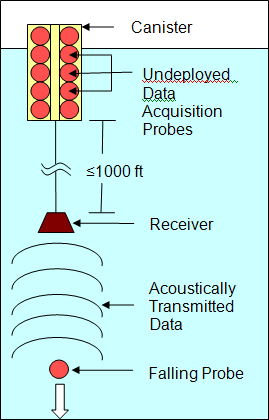 Multiple probes are stored in the sonobuoy. When a Sound Velocity Profile is required, the canister releases a probe and begins to listen for data transmissions. The probe falls through the water column while transmitting pressure and temperature data to the sonobuoy. An added capability gained by using this system is the ability to accurately determine bottom depth. Since littoral bottom structure can change quickly due to strong currents, this feature provides updated bathymetry information that is not otherwise available. Other parameters can also be measured using this technique. Invocon can work with clients to determine the best possible probe configuration for their application.